The sight of falling snow is a beautiful part of the winter season, but it can also pose potential dangers for homeowners. Winter safety concerns caused by snow, ice and other conditions arise around the home's interior and exterior, requiring extra work on the part of homeowners to ensure no problems show up. Increased moisture during the winter months can lead to ice around the home, ice dams on the roof, and even basement flooding or damage to the foundation. To ensure the safety of your home and its inhabitants during the winter season, the following projects should be done throughout the coldest months. Long before any actual storms are on the forecast, you should stock up on what you need so you don’t miss out in a last-minute rush. Essential supplies include food, water, and batteries, but also snow removal tools like a shovel and salt. If you own a snow blower, make sure it’s in good working condition and has plenty of fuel on hand. Electrical problems can pop up any time of the year, but they are especially crucial during the winter because you need the heat! Worse, damage to your electric system is a major fire hazard. Prevent electrical problems by inspecting the outside of your home, specifically looking for damaged or frayed wires vulnerable to harm from snow and ice. Check for any bird nests near electrical fixtures, as these nests should also be removed before they cause a fire. On the inside, make sure any electronic decorations have tight-fitting connections: three-prong outlets are optimal. These cords should be stored away from main walkways, and never beneath a carpet or rug, as this creates a fire hazard. If a wintery mix strikes suddenly, it can cause ice to accumulate on your tree limbs before there's anything you can do about it. And if the ice builds up too much, it can bring even sturdy branches crashing to the ground. So, it's important to trim your trees early in the season when weather is more favorable. Look out for branches that could hit your roof or come crashing through your windows, and use particular caution when trimming branches near your power lines. If an icy winter storm brings your power lines down under the weight of ice buildup or with a falling branch, don't go near them. Call your electric company to report the problem immediately. 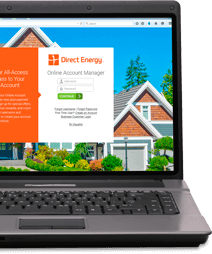 The number will be on your electric bill, but if you can't access the number, you can also report it to your local police station. Large accumulations of heavy, wet snow can put tremendous pressure on the roofs of homes and buildings. Gravity tends to lend a helping hand with clearing snow from high-pitched roofs, but for flat or low-pitched roofs, you may need to intervene if the snow accumulation is severe. Signs that the weight of the snow is compromising your roof may include visible sagging in the snow buildup, ceiling leaks in your upper floor, cracks developing in interior drywall or masonry, and creaking or popping sounds coming from the roof. In extreme scenarios, snow accumulation can lead to roof collapse. Removing this snow yourself can be extremely dangerous, especially on multi-story homes or where there are already signs of roof damage. Because of this, it’s a good idea to familiarize yourself with professional rooftop snow-clearing services in your area before severe winter weather strikes. The earlier you can get the snow cleared after a major snowfall, the more likely you are to prevent serious damage. 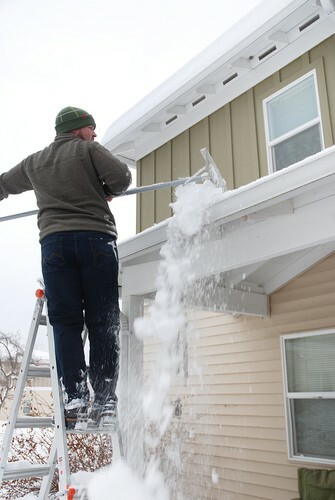 Gutters should be cleaned out before the snow falls as well, to help prevent water and ice buildup that could eventually find its way into your home. When colder weather arrives, clogged gutters can be spotted by looking for large icicles hanging from them and/or an accumulation of ice on the roof. Falling icicles can be extremely dangerous, especially if they’re large or have a long way to fall. Larger icicles may also be more likely to fall because of their weight. Bright sunshine can partially melt and loosen icicles, and high winds are also a risk factor for falling ice. It’s unsafe to use a ladder in icy conditions, so if there are large icicles on your home that are out of reach, it’s best to use caution and make sure no one stands beneath them until they melt on their own. If icicles form in lower areas where they can be knocked down with a broomstick, you should perform this maintenance early and often, while the icicles are still small. Stand well to the side as you carefully knock them down. Inside the house, prevent water issues by insulating water pipes exposed to freezing temperatures. Pipes that border an exterior wall have the greatest freezing potential, so they should be insulated with a towel or other piece of cloth. In extreme cold weather, the water lines should be opened slightly to allow water to drip slowly into an indoor sink. This encourages water flow and makes freezing pipes less likely to occur. Neglecting your pipes can bring severe consequences, as the cost to repair damage from a rupture ranges anywhere from $5,000 to $70,000, according to State Farm Insurance. It’s important to keep walking paths near your house clear of snow and ice both for your own mobility and for the safety of others who might need to use those areas. Some local municipalities mandate that snow be shoveled from public walkways and sidewalks shortly after it falls, but even if this is not required, removing snow is essential to prevent slips and falls. Once the snow is out of the way, cover icy patches with salt, sand or other type of commercial solution to deplete the ice and provide better traction. If you put a layer of salt down in advance of the storm you can give yourself a head start on keeping things clear. You should also be sure to wear appropriate shoes: either boots with rubber treads, or rubber over-shoes or strap-on cleats to help give you traction with ordinary shoes. Walk slowly and carefully, taking small steps. Take care of yourself while you work on snow removal. Large snowfalls or any heavy and wet snowfall should be handled with a snow blower instead of a snow shovel. Shoveling snow is a high-intensity activity that puts stress on the heart, according to Harvard Medical School. Prolonged shoveling can also result in exhaustion and back injuries. It's important that all lifting be done from the knees, not the back. If you must clear wet, heavy snow with a shovel, be sure to take frequent breaks in a warm area and make the job a little easier by spraying a coat of cooking spray on your shovel. It will help the snow clump together and prevent it from sticking to your shovel. While you might do a great job keeping the walkways near your own house clear and safe, you can’t count on everyone making the same effort. Make sure you wear proper footwear when you leave the house, walk slowly and pay attention where you put your feet. Ice especially can be tricky to spot and can cause potentially severe injuries from just a moment of carelessness. Winter storms can bring frigid temperatures and crushing precipitation, and the combination can be deadly for anyone caught outside without the proper outerwear. Make sure you know the signs of frostbite and hypothermia so you can spot these dangerous conditions quickly and provide proper treatment to the victim. The habitual cleaning of exhaust fans and filters in the bathrooms and kitchens should be done all year long, but it's especially important in winter because we spend more time indoors. This leads to more dust, more airborne particles from home cooking and more condensation from hot showers, all of which can cause indoor air quality issues in the absence of adequate ventilation and can even become a fire hazard. This is also an excellent time to monitor other filters in your home, including cleaning out the dryer's filter and replacing the furnace filter. Furnace filters should be replaced once a month as doing so allows the HVAC system to operate properly and keep your home warm even when the weather outside is at its coldest. Another side effect of families spending more time together indoors is that germs and viruses can be shared more easily. So, while hand-washing is a good practice year-round, it's especially important during the winter cold and flu season. Keep your bathrooms stocked with antibacterial hand soap and encourage all family members to wash after using the bathroom and before cooking, eating or playing. It's also a good idea to keep hand sanitizer in accessible places around the home and to use it often if anyone is sick, or if there are very young or old people in the household. When harsh weather pays a visit, the best option is to stay off the roads entirely. If you have no choice but to drive in the aftermath of a storm, practice safe winter driving. Stay on major thoroughfares that are most likely to be salted and plowed, and where you will be accessible to emergency workers in the event of an accident. Use snow tires and chains if appropriate, and accelerate and drive slowly. Be especially wary driving up hills and anywhere there’s likely to be ice on the roads. Snow and ice are bad enough on their own, but additional concerns arise once temperatures warm up and everything starts to melt. Be aware of flooding from nearby waterways or in low spots on the road, but also keep an eye for localized trouble spots around your house where water buildup can seep into your foundation and flood the basement. If you have a sump pump, check to ensure it’s working properly in advance.